Takamatsu is a Tsukemen and Ramen restaurant located a 5-minute walk from Hankyu Karasuma Station. 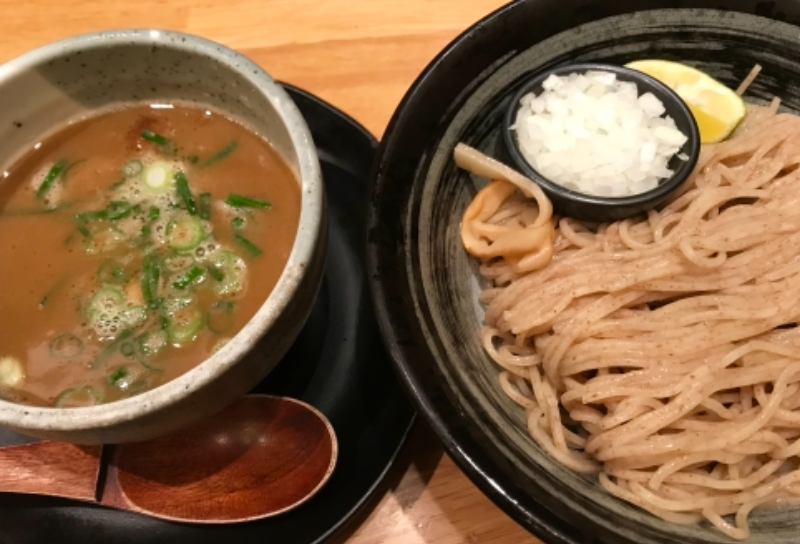 This restaurant has two specialties, Tsukemen with strong seafood and soy sauce flavors, and Ramen with a gentle niboshi (dried sardine) aroma. “Tsukemen” is essentially a type of Ramen in which the noodles and tsukejiru (dipping soup) are kept separate, and the noodles are dipped in the soup before eating, similar to zarusoba. 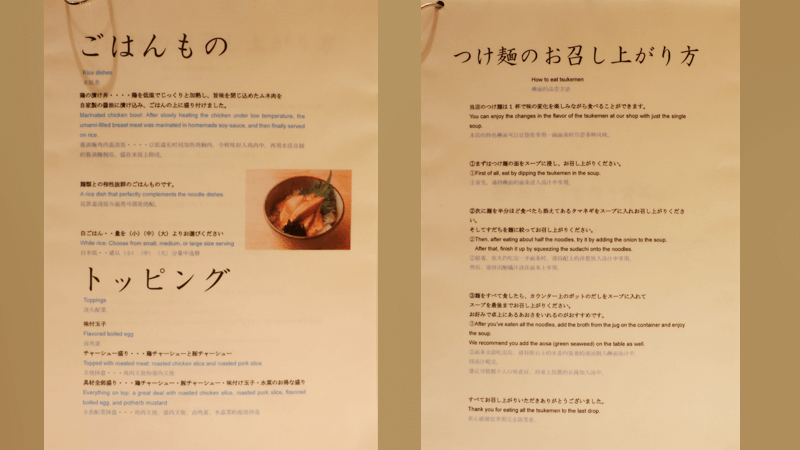 The soup (tsukejiru) is often more strongly flavored than regular ramen. The interior has a neat and tidy feel like a traditional Japanese restaurant, with a relaxing atmosphere. This ramen restaurant is located in Kyoto’s business district, so it is full of local office workers on weekday afternoons. A Takamatsu specialty, Tsukemen. You dip the noodles in the rich, seafood and soy sauce flavored niboshi-based soup (tsukejiru) before eating. The noodles look a lot like soba, have a firm texture, and go down smooth, making a great match for the richly flavored soup (tsukejiru). We recommend adding some of the onion and citrus sudachi next to the noodles after you finish the first third so you can change up the taste and enjoy new flavors. The correct way to eat Takamatsu’s Tsukemen is to add some of the dashi broth from the pot on the table to the remaining soup when you finish off all of the noodles, top it with a little bit of the aosa (sea lettuce) also provided on the table, then drink it down. Another Takamatsu specialty, Niboshi kaoru Ramen. This Ramen has medium-thick noodles in a clear niboshi-based soup. Compared to the Tsukemen, this Ramen has a simpler, lighter flavor that anyone can enjoy. Personally, I recommend adding some of the toppings and seasonings covered below. If you pay ¥250 more, you can add sliced spring onion, mizuna (potherb mustard), boiled egg, and char siu pork as toppings. You can add them to either Tsukemen or Ramen. I recommend it for people who want to taste everything Takamatsu’s Ramen and Tsukemen have to offer. If you want to add a little accent to your Ramen or adjust the flavor, try adding some of the seasonings provided. I particularly recommend the Kuro-shichimi(blend of seven spices). Aosanori has a strong fragrance, so I recommend adding it after you have finished all of the noodles. First, buy a meal ticket from the meal ticket machine inside the restaurant. Put in your money, choose Ramen or Tsukemen, and press the button. If you are not sure, go inside and speak to them in English and they will give you the English menu. You can look at that to make your order more easily. If you want more noodles, you can get Oomori for ¥100 extra or Tokumori for ¥200 extra. 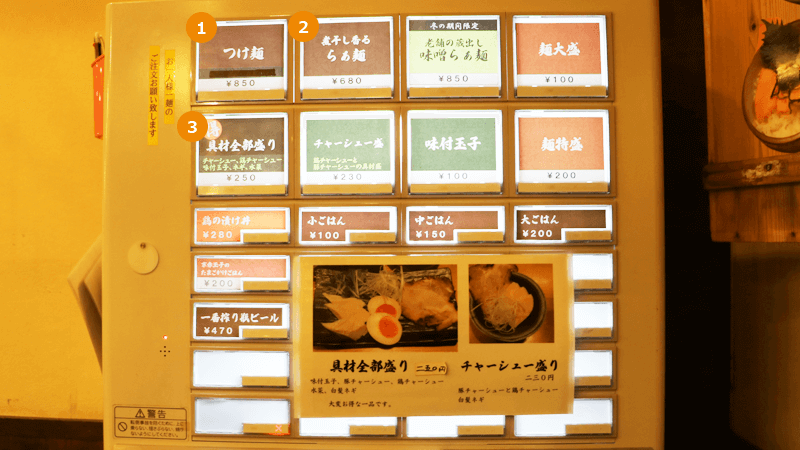 The ticket machine has buttons marked 麺大盛 and 麺特盛, so press those when making your order. I eat at Takamatsu every week. The food is delicious, of course, but another reason I like it is that it is open during late lunch times like 3:00 PM when other restaurants are closed. 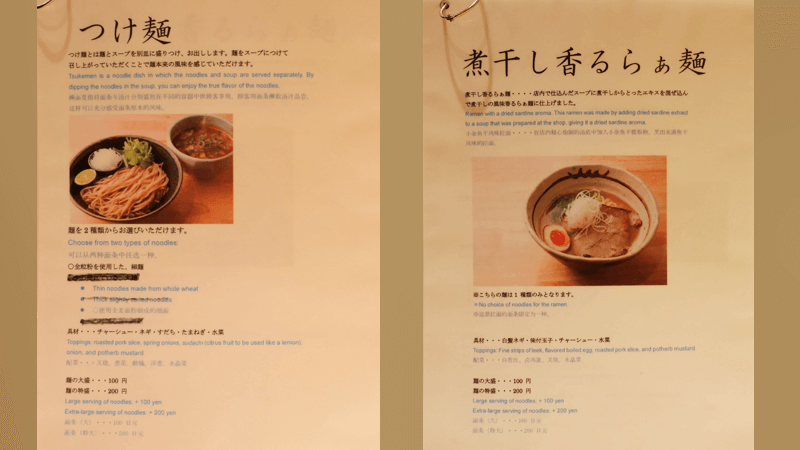 In addition to the standard menu of tsukemen and regular ramen, they also serve various other types of ramen on a limited time basis, so it might be fun to try some of those. 5-minute walk from Hankyu Karasuma Stn. It is very crowded at lunch time on weekdays, with waits of 10 to 20 minutes. They can respond to simple English.